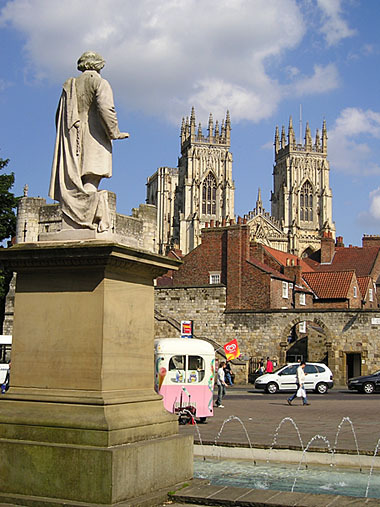 A good thing about the council’s ‘Reinvigorate York’ projects and the accompanying consultations is that they make us pay closer attention to places we perhaps take for granted. What the King’s Square saga showed is that it’s obviously better if we contribute our thoughts on the plans before the point when features are being removed and the paving is being lifted. So I hope word is getting round about the current consultation (running until 21 Feb) and that we’ll fill in the survey/consultation form. The online survey/consultation seems to be a combined questionnaire covering all three schemes. If so that’s a shame as many of us may have strong feelings about one particular project but not the other two. Reading the information takes long enough. I wonder how many people will comment via the consultation form. More than for King’s Square, I hope. 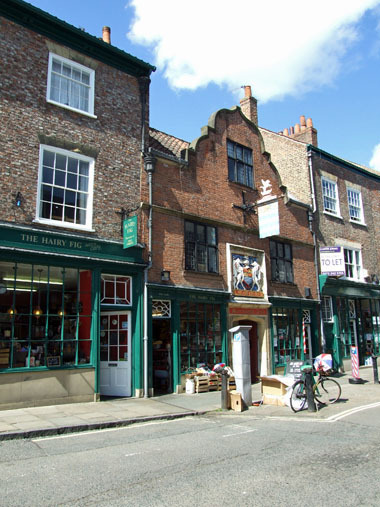 It has been mentioned often over the years that Fossgate should perhaps become another daytime footstreet, and these proposals implement that. I don’t have an opinion on this, if you do, comments welcome below. The plans also include repaving of the two entrances to the street (from Walmgate and from Pavement) and areas of pavement widening, which could include seating. I assume this must mean benches, not cafe seating, as Fossgate is very narrow. The available information suggests that these plans are not as radical and destructive as the King’s Square changes seemed. 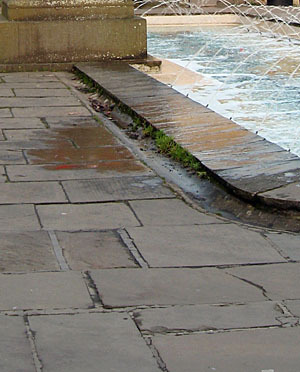 The Yorkstone paving is to be retained and added to, rather than lifted. The plan is to extend the paving with reclaimed stone (the slabs recently lifted from King’s Square, perhaps). Whether this is a change of approach in the light of the response to King’s Square, or was always the plan, I don’t know. It would appear that the paving slabs in Exhibition Square also date from the 1970s, as before then the area was mainly used for car parking, right up to the front of the gallery. I’ve already written about Etty and the fountain. Other suggested changes include reducing the size of the parking bay, and relocating the bus shelter. From my point of view, as a pedestrian who regularly walks across this area, these seem like good ideas. I can’t say I’ve ever thought ‘I do wish someone would move that bus stop’, but now they mention it, yes, it would be easier if all us pedestrians passing weren’t behind funneled into the fairly narrow space behind it. 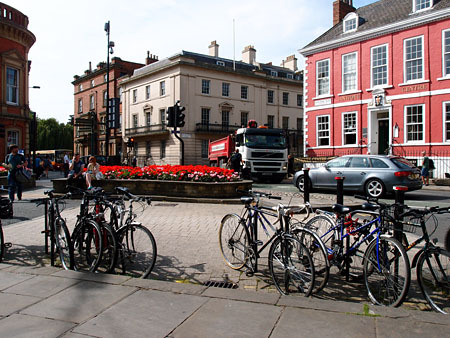 I don’t like the sound of ‘coloured asphalt’ across the road in front of Bootham Bar. Particularly if it’s reddish in colour, which would be a bit loud and attention-grabbing? When really it should be Bootham Bar claiming our attention. Particularly on a summer’s evening when its old stone glows in the late sunlight. I hope CYC keep their coloured asphalt away from here. Though the junction’s not looking that great at the moment, cluttered with Lendal Bridge closure signage. They’re right, it’s a daft clutter at present, with the raised flowerbed and triangle of bits of road. But again, ‘coloured asphalt’ is proposed, again it’s supposed to be an impressive view, towards the main focus, the Minster, and I wonder if a wide band of coloured asphalt leaping into that famous view would be an improvement? Please share the information about the consultation as widely as possible, particularly highlighting the Exhibition Square ideas/proposals. Many people were upset – and yes, I chose that word carefully, as concerned/angry doesn’t quite describe it – by the changes to King’s Square. They didn’t realise that there had been a consultation about that project. More community ‘engagement’ means more chance of more of us having a city we can feel happy about, rather than feeling angry, disenfranchised and ignored.